When I was a little girl, my mom was an adventurous cook. Instead of pork chops and apple sauce that the Brady Bunch was eating, my mom made choucroute garni. Instead of spaghetti and meatballs, she whipped up killer spaghetti puttanesca with mussels in the shell. She used to make tofu and broccoli stir-frys with fermented black beans, and serve it up to us on a regular old weeknight without even flinching. 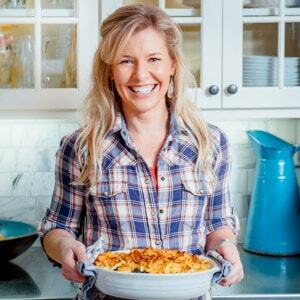 She is still an adventurous cook. But the rest of the world has thankfully caught up to her. I hadn’t thought about fermented black beans in forever, when I saw a bag of them at City Market last November. It is pretty easy to find them in a jar made into sauce. But finding them dry is not super common. So I bought them even though I had no plans for what to make with them. 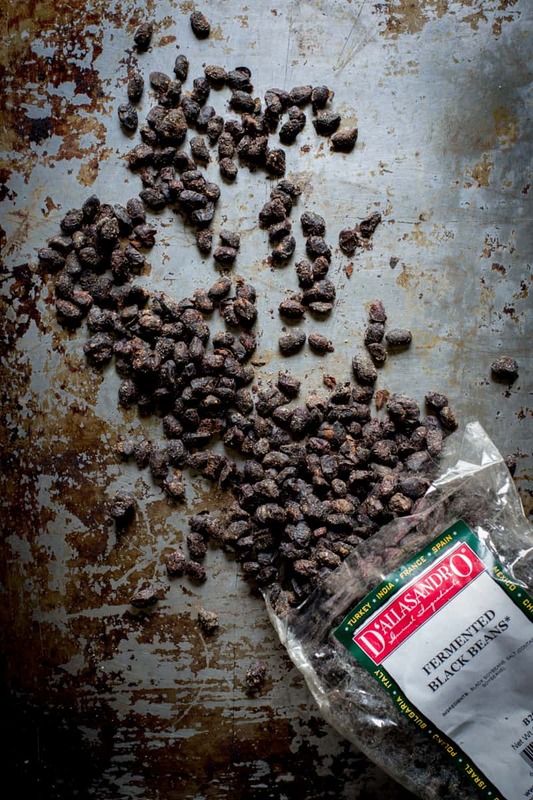 If you haven’t seen them before, fermented black beans are fermented and salted black soybeans. They’re really common in Chinese cooking. They are salty as all get out, so use them in moderation. Also, like a lot of fermented food, they have a funk factor that in small doses is totally umami and in large doses is kinda sick (and not sick in a good way.) Look for them in Asian markets or specialty or health food stores with a good ethnic section. So there I am, last November, all hopped up and excited about using my fermented black beans without further inspiration and Jase and I went out to the Prohibition Pig. There was a guy at the table next to ours who had a big ol side of green beans with his meal that looked so amazing. I had major food envy. I wanted those beans! They looked like they were coated in something dark and mysterious. Spicy looking. Dirty. I don’t have a clue what was actually on his green beans to make them look that way, all dirty like, but I already knew how I wanted to make them. Yep, the fermented black beans! So I ended up making an umami mixture of garlic, finely chopped shiitakes and the chopped fermented black soybeans for Thanksgiving and I loved them to pieces. I called them Dirty Green Beans. I wrote myself a little note to make them again for the blog when green beans came into season. And here we are at the very beginning of green bean season and I can finally share them! Bring several inches of water to a boil in a large Dutch oven or soup pot fitted with a steamer basket. 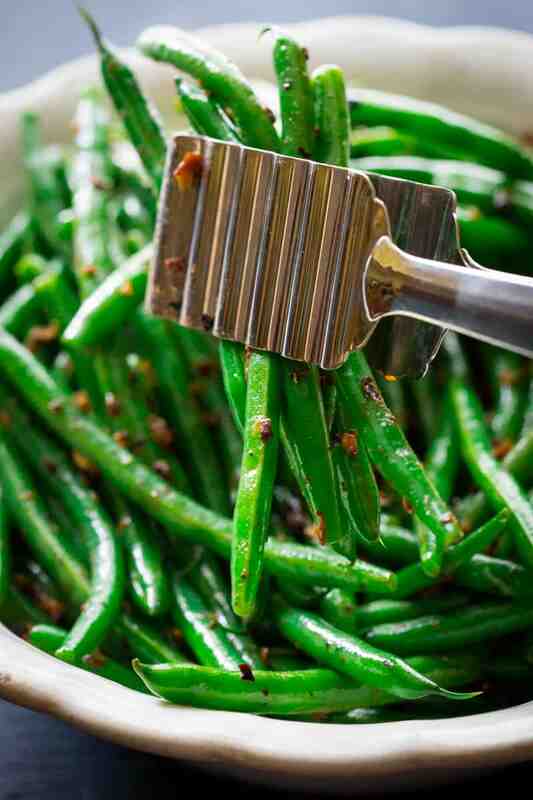 Add green beans and steam, covered until bright green and crisp tender, 3 to 4 minutes. Remove steamer basket from the pot and open up to let beans cool. Meanwhile, heat oil in a large heavy skillet over medium0high heat. Add garlic, mushrooms and red pepper flakes and cook, stirring often until the mushrooms are browned and about half their original volume, 4 to 6 minutes. Add black beans, pepper and salt and stir to coat. 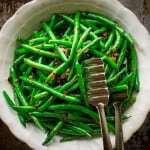 Add the green beans and sherry or shao shing and cook, stirring often until the green beans are heated through and coated, about 1 minute longer. Can be prepared through step one up to one day in advance. Store beans in a sealed container in the fridge. The beans will take a bit longer to reheat in step 3. 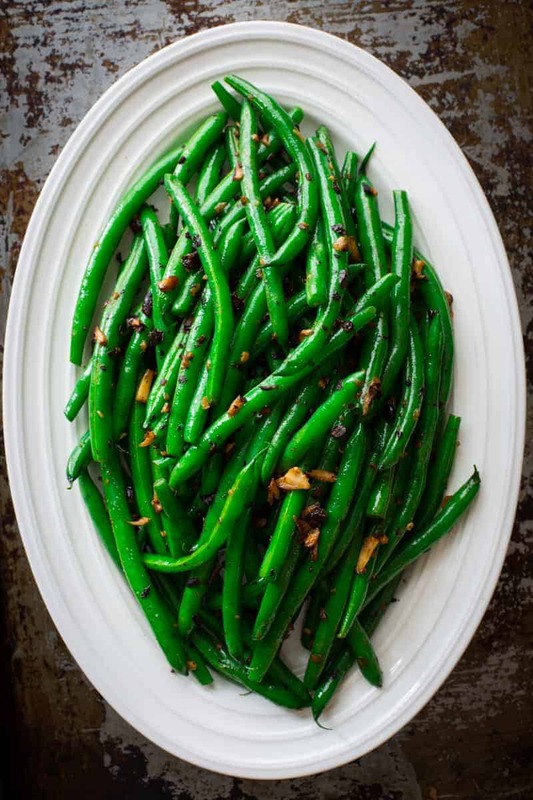 These green beans look amazing! What a great added touch of black beans. 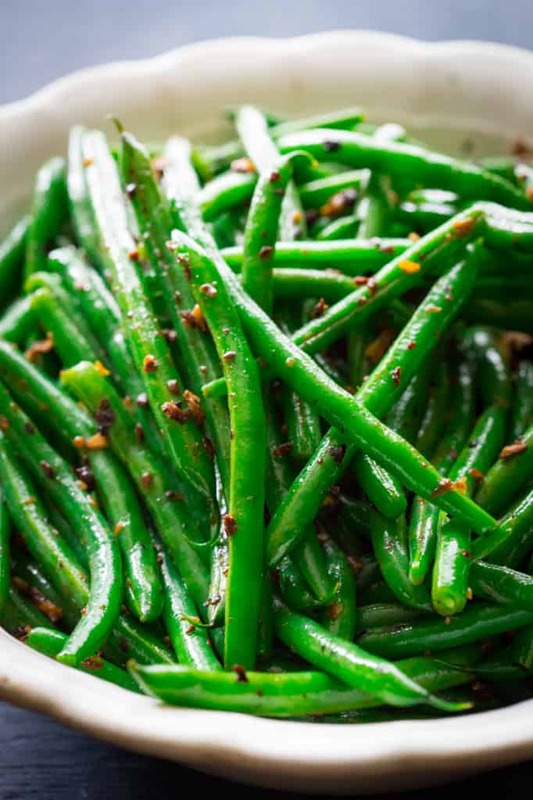 The perfect side dish for the summer! I appreciate it Lauren, glad you visited for this one 😉 And thank you for pinning! Green beans rock in my world and my mouth is watering thinking about the combination of ingredients that make these babies “dirty”! Excellent post, Katie! Why thank you Bill. That is a great compliment. They are so savory! I just had some of the left-overs for lunch and they are still great! 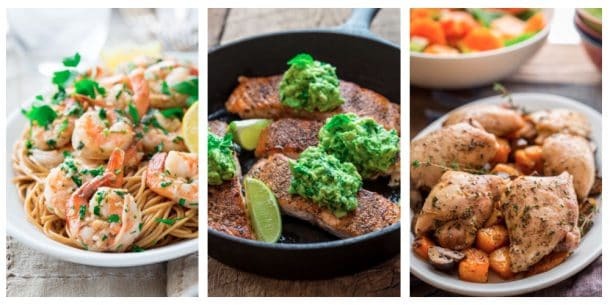 Do you think the same flavor profile would work with broccoli or baby bok choy? The beans look absolutely delish!! Absolutely Carol! I love the idea of this combo with broccoli. Just joined your site, so glad I found it! Yes! you’ll love them. I think cod, spinach and pintos sounds lovely and better than most 🙂 Glad you came by Gwen. My mom loves to make steamed dishes with fermented black beans…so appetizing and delicious. Didn’t expect that you would love them….they are quite ‘aromatic’. Oh yum! A Chinese friend made something like this for me once – I loved that salty, funky taste. I can imagine how lovely it is against crisp green beans. These photos are out-of-control gorgeous… that light! Thank you so much Alanna. I used some of your tips for these photos! No joke 😉 I used the noise reduction slider for the shots with the hand held tongs since I had to jack my ISO. Thanks Natalie, so glad these caught your eye. 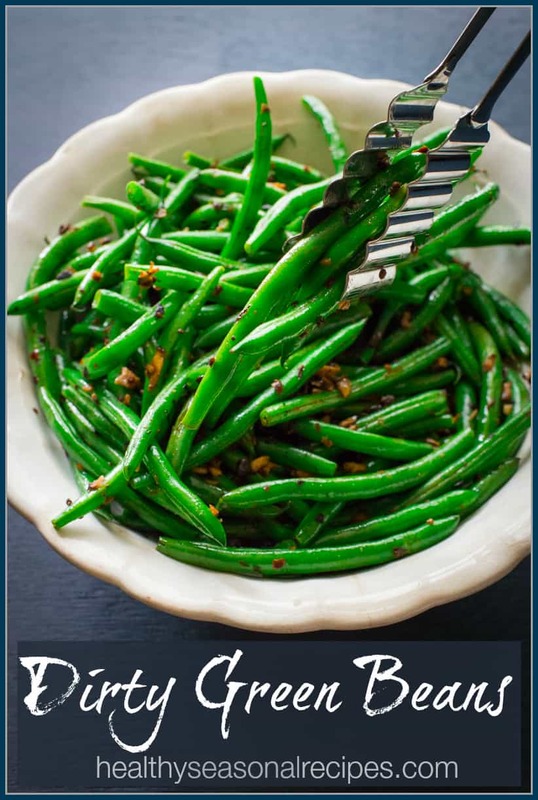 These sound like the beans at A Single Pebble – I am going to go out and look for the fermented beans- can the beans be frozen as only 2T are called for in this dish? Oh i love a Single Pebble! The mock Eel is amazing! I haven’t had their beens, but now I know to order them. I haven’t ever bought fermented black beans frozen before, but my guess is they would work just fine. I found these at City Market in the international foods section. Good savory side to contrast with sweetish chinese or vietnamese mains. 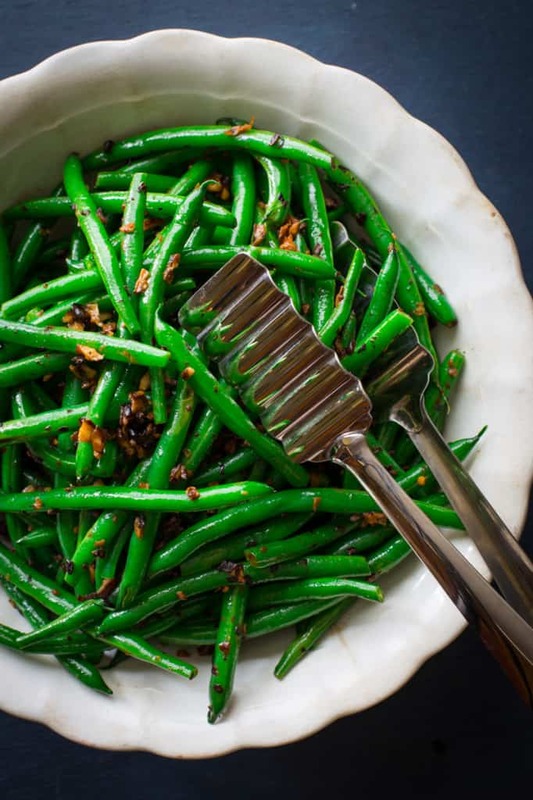 I found that the black bean and garlic tended to slide off the oily green beans while I was tasting the dish so added a cornstarch slurry to help it stick to the beans. Would also recommend doing the pre-cook step in the microwave. Wash the beans, leaving some water clinging and zap.